By design, most books in a crime fiction series allow readers to follow the lives of the main character and perhaps some of the secondary players over the course of time. However, it is more rare that readers are given access to re-visit with a character who was integral to a crime in one of the earlier novels. Never one to give readers the expected, this is exactly what Karin Salvalaggio does in Silent Rain. In Salvalaggio’s debut novel, Bone Dust White, Grace Adams was central to the plot and her interactions with Macy Greeley were one of many reasons readers immediately latched onto this series. Bone Dust White wrapped up things very satisfactorily, so there was no expectation that readers would encounter Grace again – until Silent Rain came along. In this new novel, Grace is mixed up in a whole different crime, one that not only makes for a compelling focal case for Macy Greeley to investigate, but also serves as a catalyst for readers to discover how much Grace has changed since her previous brush with law enforcement in that debut novel. In a clever and creative move, Karin Salvalaggio manages to tie the new crime to Grace’s past in such a way that new readers need not have read the earlier book to follow the current plot. Yet, for those who have been with the series from the start, Silent Rain will offer a bit of a nostalgic visit with this much-loved character. 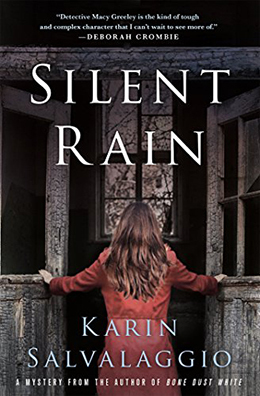 In Silent Rain, Grace Adams has been manipulated by her college writing tutor to reveal the traumas of her past – something she has spent the intervening years trying to distance herself from. This man, celebrated novelist Peter Granger, wants to use Grace’s story as the basis for his next book, but allowing this would mean Grace’s identity would be exposed to the world once again. As bad luck and poor timing would have it, the body of a man and a woman are soon found in the fiery debris of the Granger family home. It is quickly suspected that this is the work of an arsonist/murderer. With all evidence pointing to the victims being Peter Granger and his wife Hannah, suspicion is sure to fall on Grace Adams. Thankfully, Macy Greeley is called in to help with this case and her investigatory skills expose Peter to be a flawed man with more than his fair share of enemies. Once again defying expectation, Karin Salvalaggio structures Silent Rain in such a way that the eventual meeting between Macy Greeley and Grace Adams does not occur until three-quarters of the way into the novel. As if the central mystery were not enticing enough to keep readers turning the pages, the anticipation of this reunion works as a further lure keeping readers on tenterhooks as they continue to consume the book at lightening speed. Much of the background for that central crime lies in Peter Granger’s career and his work with the students in his writing group. 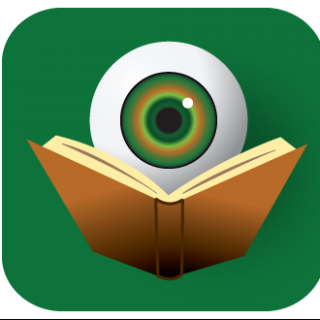 Because of this, Karin Salvalaggio is able to present subtle commentary on such bookish topics as: genre-shaming, reader reviews, ghost-writing, and the general state of publishing today. None of this is done in a heavy-handed way, but all of it is fascinating for both the average reader and those within the industry. Through it all, Macy Greeley remains a character readers will want to follow. Long time fans have seen her mature over the course of the series and in Silent Rain, when she notices a colleague making some of the same mistakes that she has made in her own life, Macy is now strong enough to offer assistance and advice. With Grace Adams’ horrible past also in play, one of the major themes of Silent Rain is the resilience of the spirit. Given enough time (and effort), even the most traumatic things in life can be viewed as moments of learning. These events can – and will – change a person, but deep down, the core of a being is what remains steadfast. Like a sudden storm washing away the grime, Karin Salvalaggio’s Silent Rain exposes both the flaws and goodness of humanity. After the review I bought all 4 Karin Salvaggio’s books and I’m in love with her! Thank you!